Participants of a rafting trip cross a hillside above the Upper Salmon River in Idaho in August 2016. Tumushabe Annet is anointed by Pr. Yiga Maiko at the Born Again Center for Hope in Kira in January 2016. Speaking after the service, she burst with excitement, explaining how badly she needed the experience and the peace she felt now. Apiza Amitova attends a journalism class at the Osh Technical College with her peers in November 2013. Apiza also works full time for the news agency Osh Shami, covering media within the city. Zander Ebin and Danielle Lynn ascend a multi pitch climb at Smith Rock State Park in Oregon in July 2016. Ambassador Samantha Powers, US Representative to the United Nations, stands before Pablo Picasso's Bombing of Guernica painting as she addresses press during the 2014 United Nations General Assembly. Speaking to the conflict in Syria, she restated several times that the United States simply informed the permanent representative to Syria rather than asked for permission to begin airstrikes on ISIL held areas. Known as one of the most powerful antiwar paintings of all time, Picasso's Bombing of Guernica depicts the bombing of the basque town of Guernica during the Spanish Civil War. Jerry Washburn stands in front of his home in Marion, AL in May of 2015. Ilyas prerecords the daily news in the newly constructed basement studio at Jalalabad Teleradio Company in June 2013. The building was just rebuilt after being burned down three years prior in ethnically charged rioting in the Fergana Valley. The station was accused of sympathizing with Uzbek leaders that were perceived to be separatists. Ali sits from his car and watches as a group of actors performs participatory theater for a community outside of Bor town in South Sudan in February 2016. Although generally timid to outsiders, the group consists of trained actors that visit the community hours in advance to gain information before presenting. After which they develop plays around the conflicts that exist within the community, showing alternative methods of resolving the problems that exist there. Jamelia Payne is singing as part of a gospel choir at a CD release party at Maranatha Church in Northeast Portland. Also known as Johnny Lee Matthews, the Music Man, stands in front of his lean to off of County Road 19. He’s been out here for 20+ years and rides into town on his moped for supplies. Watanabe Yoshiaki, 63, stands before his rice fields in Tome, Japan. He is a fifth generation farmer on this plot of land. He plans to sell his rice fields in the future, despite farming this land for more than 40 years. Rather than take over, his three children have all moved into the city and taken up office jobs. Despite being a superior product, the price of Japanese rice has decreased in recent years as high quantity and external exports have driven prices down. “I have no future generations, and no desire to continue. I lost my heart for farming because there is not enough money," he says. 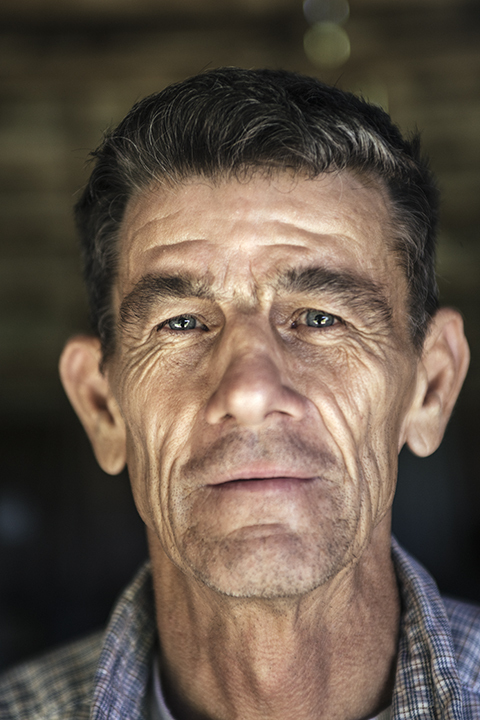 Silvas Darago lost his vision at around 22 to onchocerciasis, which is also known as river blindness. Today he works with four other blind masseurs at Seeing Hands Center for Massage in Juba, South Sudan. They were trained in Japanese-style massage in 2013. 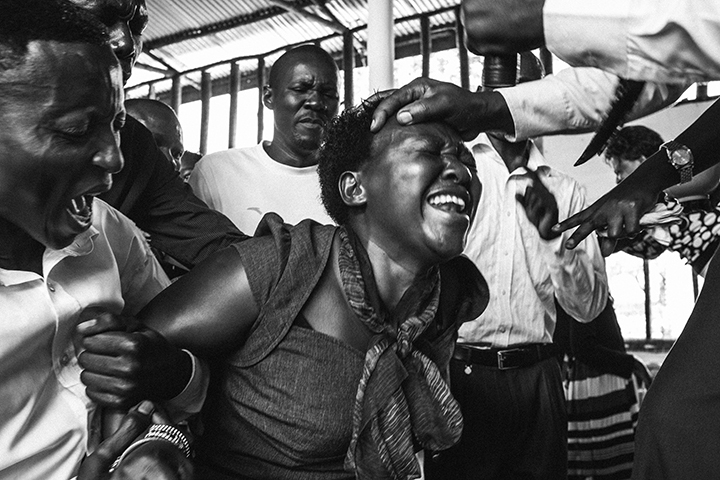 For about 100 South Sudanese pounds (about $2.70) clients get a relaxing one-hour massage. Zeyneb Akel on a lit concept shoot in Portland, OR in 2015. Ituango Police Officer Pablo M. stands at the site of a bombing from years earlier on September 27, 2016. This region has been characterized by intense distrust between the general population and government forces. In previous years paramilitary groups sponsored by the government have committed terrible atrocities within this municipality that has long been viewed as sympathetic to the armed group FARC. Since this photo was taken, Pablo has taken over new responsibilities because his superior was shot at and subsequently relocated to Medellín. In 2010, ethnic rioting ripped through the Fergana Valley as Kyrgyz destroyed Uzbek homes inspiring retaliatory attacks. Located in this valley are Umida and Elishbek, who are a mixed Kyrgyz/Uzbek couple. Here they stand infront of a small garden inside their home in Ala Buka Kyrgyzstan. "It takes time to raise a family," Elishbek says. They have been married for 1.5 years and have a son, Abdul Jaffar who is 7 months old. Umida (21) is ethnic Uzbek, while her husband Elishbek (24) is ethnic Kyrgyz and works as a farmer. This is part of a larger body of work that profiles many families who have extended family on both sides of the conflict. The 2015 Ben Hurt Chariot Wars in Portland, OR. It is an annual event taken on by the informal bike gang "Zoobombers". Following a show of force ride through the city, competing bikers ride on a track in a figure eight motion. Bikers must push over other riders over as they circle the track under the highway bridge. Rower Andrew Fu collapses after completing a 2K row at the Tough Love rowing competition within the Chiles Center at the University of Portland in 2015. 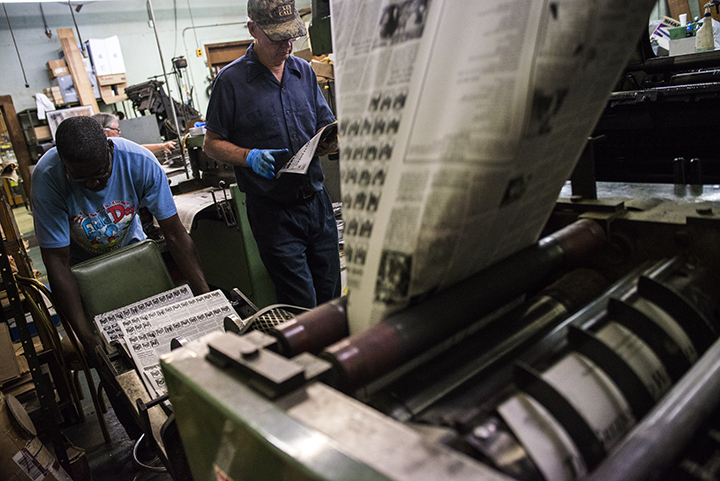 Printed in-house since 1876, the weekly Greensboro Watchman provides news for the greater Hale County. The boundary of a clearcut on privatized timberholdings in Mowich, WA in December 2015. Eva Angus stands in a wooded area at the Nisqually Tribe campground during a week of celebrations after landing as part of the annual canoe journey. Hundreds of coastal tribes send representatives in canoes made from up to 300 year old trees to complete the journey that can be over 600 miles. Eva paddled with the Native American Youth and Family Center canoe family, as they made the journey for the first time. The urban tribes center was the only multi tribe delegation. Eva is born as Nez Perce, Cayuse, Tlingit, and Haida. Ken Helfrich ties a fly while Daniel prepares a Steelhead Salmon the was recently caught on the Rogue River in August 2015. This is an image of a ua neeb ceremony in Happy Valley in April 2016. I was introduced to Tou in 2014 and have been learning about his community. Here, Tou helps his cousin enter a trance as he trains him in becoming a txib neev, or a Hmong shaman, at their relative's home. The shaman is typically an elder in the community, but Tou, despite his age, is using the role to bring his family closer together and preserve their heritage. 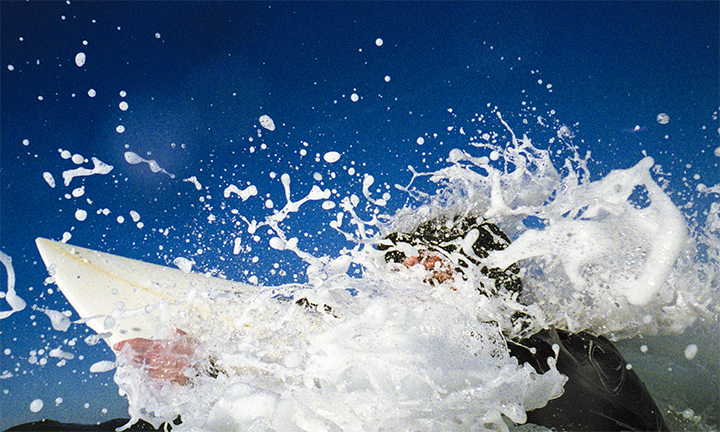 Mike Wehrley heads into the Pacific in the quest for the perfect wave. Mbinga stands for a portrait in the Gugulethu Township in South Africa. 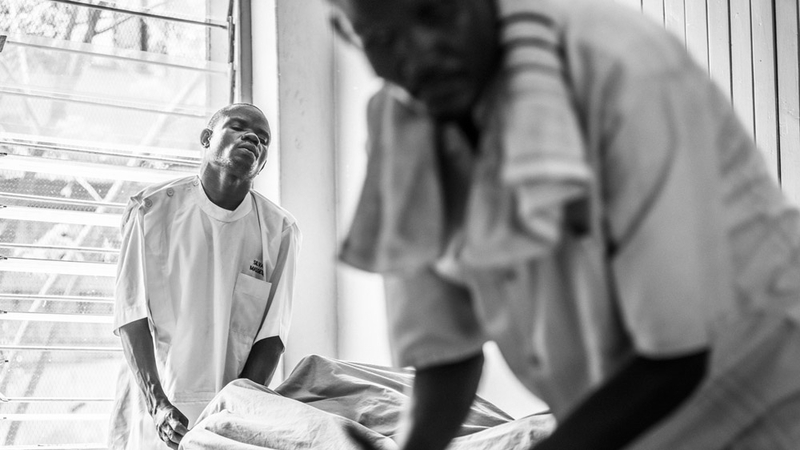 Originally from South Kivu, he fled because he was being targeted because of his ethnicity. South Africa is often praised as the rainbow nation. While in the township we heard over 11 languages one day.